Extracts from old books on the Monikie, Scotland Website. Extracts from the following . . Volumes 1 - 5, (c.1882) by A. J. WARDEN, F.S.A. Volumes 1 & 2, (c.1885) by ANDREW JERVISE F.S.A. (c. 1853), by ANDREW JERVISE F.S.A. (followed by the original book page numbers) in the list of extracts below. flouds, abbies, townes and other notable things conteined in the same." CLICK HERE for some transcription of Statistical Accounts (c.1799 and c.1845) for a few Angus parishes (also for Skirling Parish in Peeblesshire). Graphical representations of the pages of the Statistical Accounts for all of Scotland are available on-line at http://edina.ed.ac.uk/statacc. You will find below, links to extracts from the above named books. The serious reader is advised to refer to the original in order to see all the cross references, etc. which are not included in the extracts. No attempt has been made to explain the reason for, and the method of compiling and printing the original books. The extracts all contain something of interest or connection with other pages on this website. They may relate to local Monikie area interest or Family History Interest, and in most cases to both, as well as other connections. There is considerable interaction between the extracts and it would be advisable to read all for a complete trace of names and events mentioned. The site Search Engine should be used to follow-up the various references on other pages, although spellings can differ. In some, but not all cases, part of the text will form a hyperlink to another page or portion on this website. The reader may have a feeling of 'déja vu' when reading various extracts, or just in one, as the same information is often repeated. You should keep in mind at all times when reading the extracts that the original books were written well about 120 years ago and that references such as '. . the current proprietor is . . ' must certainly be out-of-date. Some buildings referred to, as of other entities, may no longer be in existence, or available to public view. The terminology used is of the Victorian era and can be difficult to understand. Finally, but importantly, the spellings of proper names, place names and other words may be different from that of today, and also vary throughout the extracts. This reason is that some the source document/s for the information contained in the books can itself, be centuries old. You may need a quick translation service to understand some of the Scots words on this website - you can get that online at www.scots-online.org. Click on the underlined filename.htm next to the 'book'. aorf4:146-155.htm - Duntrune, also Balunie, Claypotts, Fintry, Gotterstone, Powrie, Baldovie, etc. 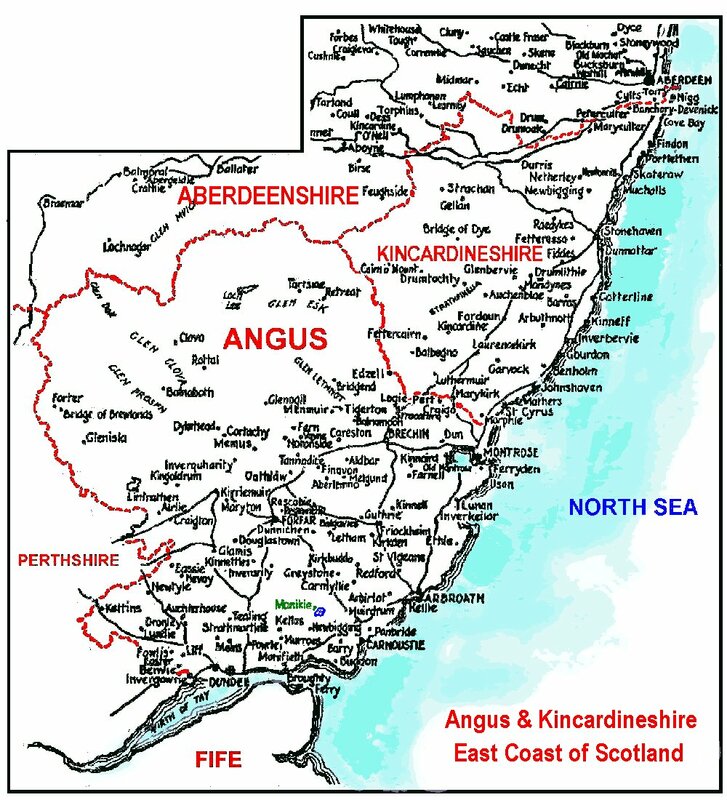 aorf(x):168-171.htm - Angus Parishes - Lethnot & Navar, etc. lol:115-115.htm - of Navar, Edzell, Glenesk (Edzell, Glenesk, Glennie, Lindsay, Stirling, Lethnot, etc. Stirlings of Glenesk - In Latin with translation and sources. The text of these extracts are indexed as part of the Search Engine for this website so it is well worth trying for other entries. Remember to try several different spellings - e.g. Guildy or Guildie, Denfind or Denfiend, Affleck or Auchenleck, etc. The original books used to produce these extracts were mainly sourced by the Webmaster and are available, for reference only, at the Public Library, West High Street, Forfar, Scotland. Copies are available elsewhere.